In order to specify the “COMOVA” application related input, the user opens the *.comova-file in the COMOVA editor shown in the figure below. Physics: parameters for reflection and scattering of molecules during the mission as well as density and constituents of the atmospheric conditions the spacecraft will pass. Ray-tracing and Numerics: allows fine adjustment of ray-tracing details (ray-tracing is the most time consuming activity in COMOVA). Results: specification which results shall be produced. 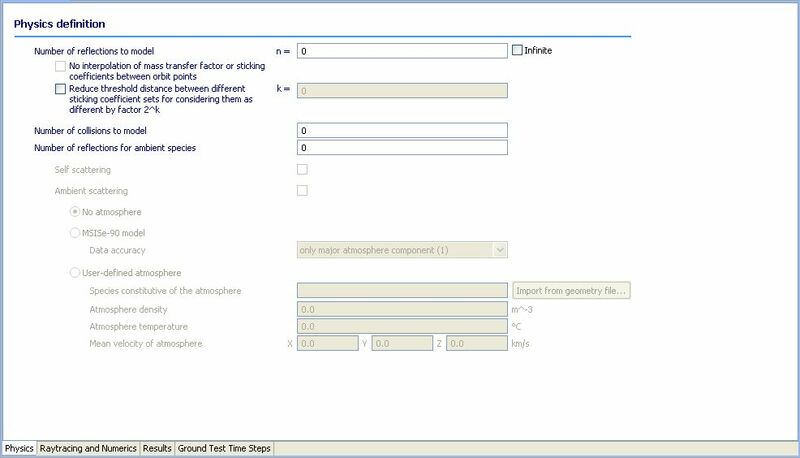 Ground Test Time Steps: allows the input of time steps, which are need for a COMOVA ground test analysis.